We’ve mentioned previously that despite food trucks not (yet) being allowed to operate on a daily basis here in the Inland Empire, there seems to be a food truck event nearly every weekend here. This weekend brings an event just outside the Inland Empire. 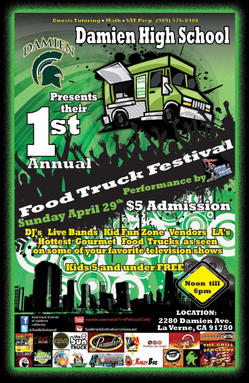 Damien High School, 2280 Damien Ave., La Verne, is hosting its first food truck festival from noon to 6 p.m. on Sunday (April 29). A flier advertises DJs, live bands, a kids’ zone and 18 trucks, including the I.E.’s Suite 106 Cupcakery. Admission is only $5, and kids five and under are admitted free. The trucks listed in the flier offer a pretty good variety — everything from sushi burritos to gourmet sliders to fried chicken to Korean buns. Click over the jump to see a list of scheduled trucks. This entry was posted in La Verne by John Plessel. Bookmark the permalink.